We’ve never had a binary keyboard here before, but we have ventured into the world of classic high quality keyboards several times. This feature on IBM capacitive keyboards for example, or a look at IBM terminal keyboards. Or two and forget the clock as the enter-key is redundant. The entire interface can be a tree traversal system where you start at the top of the tree and can see yourself selecting nodes on lower branches by clicking 1 or 0 (L or R) until you get to “leaves” then that character is selected and you find yourself at the top of the tree again. Obviously there are more efficient systems where you select entire concepts rather than individual symbols, a tree of depth 20 will give you just over 1 million concepts that you can express. The trick is the system you use to order/enumerate the concepts in a useful way so that you can navigate the tree and know where you need to go to express an idea. One helper method is to have the default concepts showing, i.e. for any given point in the tree the two concepts you would express if you just continued with a string of 1 or 0, then you always have a sense of your position within the concept space. This comment made my week. Thanks, I needed it! Like connecting directly to the PS/2-or-something connector with a pushbutton and emulate the keyboard controller in wetware? Technically, I’ve seen hams use a code key as an input device (and there are things like freq counters that output code), so you basically have a “one button and one light” I/O system. The “return” key seems impure. I want one with just “0” and “1”. Yes it can, you just encode the code in another code that fits into the symbol range of Morse. Hey we can have a bastardised 5 bit version of uuencode for a pr0n jpegs over Morse protocol. Gee thanks, now I’m going to have to spend all morning reviving a 9 pin dot matrix and finding fanfold paper for the authentic pinup experience. Oh no, better call Xzibit! But still synchronous ternary, isn’t it? two types of pulse, and gap. If anyone don’t get that, some older typewriters, particularly compact or portable ones didn’t have zero on the number row. Some didn’t have a one either. And to make an “!” you had to combine period, backspace, shift, and pipe. No joke. So THAT is why the typewriter I found at goodwill had no !. Full-stop and apostrophe, usually, there isn’t often a pipe on a typewriter. I would have saved this for April and launched a kickstarter! I learned to program on a bigboard by ferguson (z80 cp/m single board computer), and we used parallel ascii keyboards. they were 7 bit keyboards on a 8 bit bus (the keyboard driver thought they were 8bit), The eighth bit was usually tied to zero in the keyboard, except in one keyboard, it had a programmable key. There was an 8 position dip switch. you set the dip switch to the value of the key you wanted to press, then pressed the programmable key and that keystroke was sent. Oddly useful. 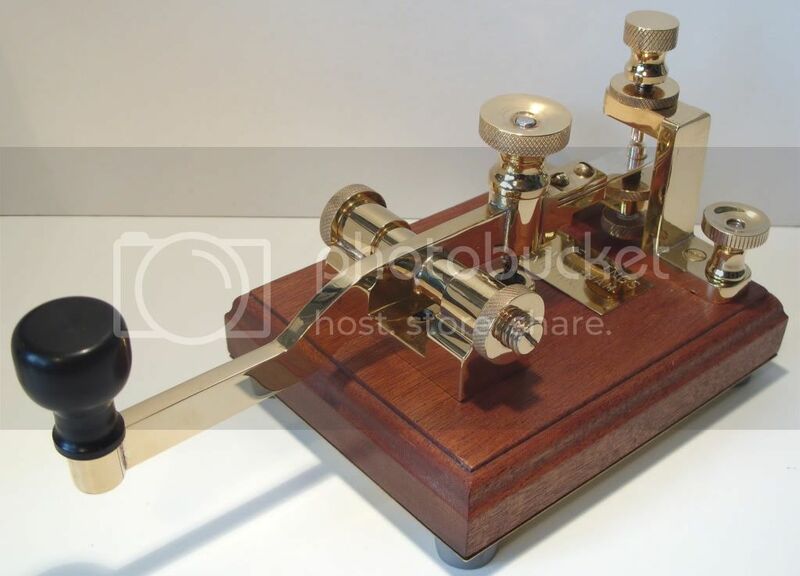 …you nailed it, and the telegraph key was developed in the mid-1800s. A memory is a terrible thing to waste. I have another idea, maybe you could fit some kind of motion sensor underneath and use it to move a special character on the screen which can be used to interact with items displayed on the screen. Like an indicate and press interface. But the baud rate would be 1 bit per day, unless you ate a lot of curry. In the western world the left is lower and right is higher, tinkle a few piano keys. It’s backwards. On left of off, backward. Found increasingly more and more. It irks me when standards are swept aside because of AADHAD and “whatever”. If frequency of use dictated what is first, then alpha-order would start with etaonirsh etc. A “bug” key has 2 paddles and should do nicely. Vibroplex is the name. Is it maybe how people who only ‘read’ audiobooks spell ADHD? That’s actually a really clever observation. Does that board have any I O ? Hex keypad would be useful! what if you make a mistake… definitely need a backspace key! Finally! I have been saying for years that typing is too easy! Personally I would add a Hawking style dynamic lookup table. Look up what you’ve already typed and give you options for the next sequence. I do not know the “Hawking style dynamic lookup table”, but you describe the way a smartphone makes typing/auto completion suggestions. I think he means Stephen Hawking’s talk box, that predicts his next words and offers him up a choice. Next level on from auto-complete. I once met a guy in a wheelchair, who was severely disabled. He had a talker using Blissymbols, Charles Bliss’s idea for a new way of writing. Had a large LCD screen, and I think altered the display to bring the most likely symbols towards where was easiest to hit, as he typed on it. I’d heard of Blissymbols before but didn’t know they’d found a use anywhere, but apparently they’re popular for things like speaking machines. Faster than typing, important if you’ve got limited motion. None of those systems is rational, they are not unlike a typesetting keyboard for Asian languages. The position on the board does not mean anything, usually it is arbitrary with no conceptual clustering so you need to map the entire thing in your head to know where to reach for the next key. Philosophical question. If you have one infinite group of monkeys with this, one with a qwerty keyboard and one with a dvorak, which group types a work of Shakespeare first? Dvorak, because it’s arranged according to letter frequency. Then QWERTY (just had to remember how to type QWERTY, duh! ), then this. Nah, out of an infinite number one will not only mash keys in correct sequence but at the maximum physiologically possible rate and since there’s no brain stumbles because they’re not actually thinking about it, qwerty and dvorak should finish at exact same time for the first copy of hamlet, however, it will be around 8 times as long getting copy out of the binary kb batch. Except that monkeys may have a preference for fruit shaped letters. The only logic of 8 times is if the monkeys for some reason do hit the ‘enter’ after typing 8 times randomly on the 1 and 0. In fact the chance that they will hit 8 1 and 0’s then enter is probably insanely small and it would take a million times longer. planned, I most certainly will talk about this with my audience. This is freaking great. I truly enjoy all the new gens out there and different tracks you can take.